The Beautiful Game – A weekly exclusive where fans talk about their fondest footballing memories. Harshit Sarin, a 21 year old graduate from SCMS Pune kicks off the inaugural edition. My earliest recollection of kicking a football dates back to the early 2000s when I was about 5 years old. I played with my elder sister and a few other neighborhood kids. I didn’t know the rules of the game so when my sister first passed the ball to me, I kicked it into the goal, not knowing that I was the goalkeeper and the first goal of my life was an own goal. My childhood in Delhi consisted of playing cricket and football, but I was always attracted to football a little more. This might be partially due to the fact that my leg-eye coordination is better than my hand-eye coordination. I was always made the goal keeper due to my lack of athleticism (leg-eye coordination would not make up for my lack of coordination during my formative years), but I like to believe that I learnt a lot about the game by watching everyone else play up the pitch. Fast forward a couple of years and my family emigrated to the United States. I was about 9 years old and my definition of “football” took a tumble. It was now associated with an ugly, brown, oval-like pigskin that all my peers were crazy for. (I didn’t have any peers to play ‘soccer’ with.) Don’t get me wrong, American football is fun to play, but both my middle fingers are broken because of it. It’s nothing like the beautiful game, which flows like water. American football is more about brute strength whereas soccer (as I fondly remember calling it) is more suited to the agile and swift. One of my fondest memories of soccer was the FIFA World Cup 2006 final . It is the only world cup where the team I was supporting during the final actually won (I was rooting for Netherlands in 2010 and Argentina in 2014) . I was ecstatic when Trezeguet hit his penalty onto the cross bar and I erupted when Grosso coolly slotted in his penalty to take it home for Italia (I have vivid memories of myself getting up on the living room table and screaming at the top of my lungs.) However, I didn’t play too much soccer when I was in the United States. (I was more into skateboarding at the time; an affinity that has lasted to this day.) America simply lacked the environment for soccer. It was too preoccupied with baseball, basketball, and American football. My family and I moved back to India a couple of years later. It was around the time the FIFA World Cup 2010 was kicking off in South Africa. All my neighborhood pals were crazy for football. I joined them for evening matches and soon bought myself a pair of football boots. A little Argentinian footballing prodigy by the name of Lionel Messi was doing the rounds on the internet and newspapers alike. I was immediately allured and upon further investigation, found out he played for a club by the name of FC Barcelona. Having always wanted to visit the city of Barcelona due to its connection to the skateboarding community, I decided I would become a Barca supporter. I stayed up till odd hours to watch their Champions League matches, and catch their La Liga highlights on YouTube (La Liga would be televised in India a couple years later). This was also around the time when my cousin Geet was enrolled in DU. Geet Dada is a self proclaimed Gunner (or is it Gooner?) and he taught me everything there is to know about football. To this day, I have a soft spot for Arsenal when it comes to the Premier League. The first season I followed FC Barcelona was a dream season. It was 2010 – 2011 and Barcelona won the La Liga and the UEFA Champions League in one season. The golden trio of Messi, Villa, and Pedro (MVP, as we called them) were at the pinnacle of world football when each one of them got a goal in the Champions League final between FC Barcelona and Manchester United. (another one of my most cherished football memories) (sorry Anubhav ) I was an ardent football fanatic until college happened, in 2014. Between 2014 to 2017, I barely followed league football let alone play it. That is, until a couple of weeks ago. Two very fortune moments occurred that would put me back on the path of all that is round and kick-worthy. First, my good friend Karan invited me to play footy with him and his friends. He told me that they play during the weekends on a turf ground not too far from where I live. I have been spending my Saturday and Sunday evenings kicking ball instead of lazing about and I’m absolutely hooked-for the third time in my short life. 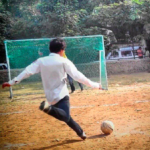 Second, my good friend Anubhav from college started a footballing blog by the name of “El Arte Del Futbol”. He’s made me an editor so that I can help him polish and finish up the articles that are contributed to the blog. It feels good to be a part of a footballing community, especially since it’s something I can contribute to. I look forward to weekends again, because I can enjoy football both as a televised event, and as a sport. I feel optimistic for the future, because my flames of football passion are slowly being rekindled. Cheers to the beautiful game. The post The Beautiful Game – Harshit Sarin appeared first on El Arte Del Futbol.